It's almost cherry season. Well, I hope it's almost cherry season...I read recently that Michigan's cherry crops suffered through some strange spring weather this year & farmers may lose 90% of their fruit. This makes me very sad. Awaiting the arrival of Montmorency tart cherries is something I look forward to every year. 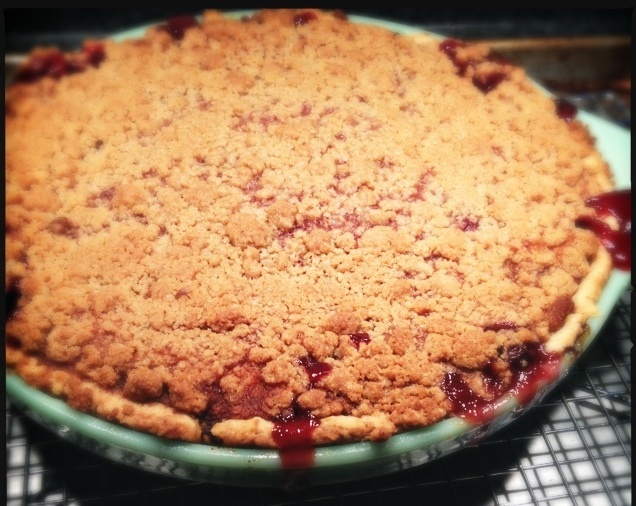 Sour cherry pie is probably my favorite dessert of all time. Luckily, I still had a few pounds of last year's cherries in the freezer. So, last week I tried a new pie recipe that I found on Bon Appetit's website. It's made with a traditional pie crust on the bottom (I used my favorite crust recipe), a sour cherry filling (no gooey canned stuff, please! ), and a crispy, cinnamony struesel topping...perfect for those of use who can't seem to get that top pie crust to look pretty! * I like a tarter (more tart?) pie, so I cut back to 1/2 cup of sugar. ** Look for fresh sour cherries at farmers' markets or use Bing cherries instead and add 1 tablespoon fresh lemon juice to the filling. For the filling: Position rack in center of oven; preheat to 375°F. Place foil-lined baking sheet in bottom of oven to catch spills. Mix first 4 ingredients in large bowl. Add cherries; toss to coat. Let stand until cherries begin to release juice, stirring occasionally, about 10 minutes. Transfer filling to chilled crust, mounding in center. Sprinkle streusel over, covering completely and pressing to adhere. For future reference, I need to be invited to all future pie eating events. Thanks. By the by, that looks amazing! I will remember that, Eric. I had to take the pie to KC to share so that I wouldn't eat it all myself!